The Hatiku Liveaboard is a traditional phinisi maid boat made from high reliable materials like teak and ironwood. 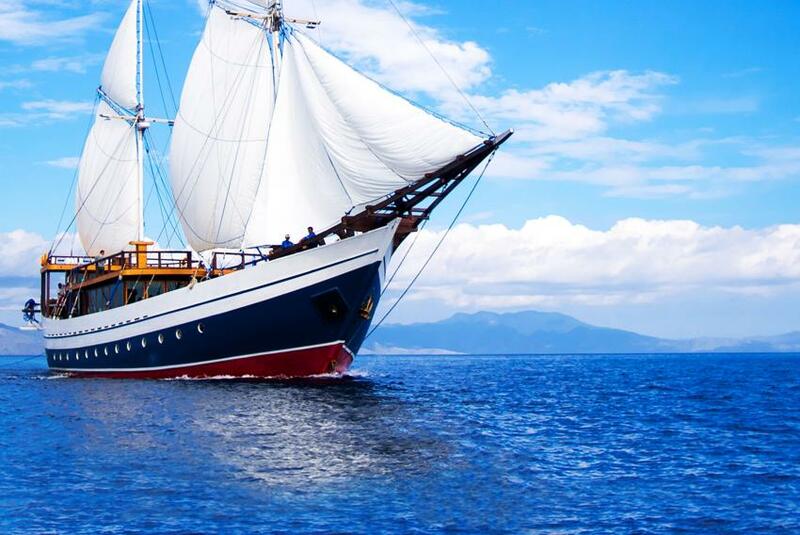 This yacht was designed to give you diving vacation in Indonesia great and fun. Boat has 6 cabins, equipped with private showers with hot and cold water, air conditioning and storage places for private belongings. Hatiku' salon is comfortable to relax in between and after diving. It has air conditioning and a panoramic view in addition. Meal are also served here, but you can also take with you to boats sun deck. Passengers will find there a gorgeous view and a big comfortable sitting area. Dive deck of Hatiku Liveaboard has plenty of space to store gear. There is a tank with fresh water to rinse equipment after diving and showers. Also, the boat provides divers with nitrox. Safety is one of the main concerns of Hatiku Liveaboard crew. There are all necessary facilities to ensure safety: liferafts, fire extinguishers, life jackets, first aid kit, fire smoke alarm. If you loving to do underwater photography, Hatiku Liveaboard would be a good choice for you. Boat has a special camera room with two big benches to work with cameras and numerous charging points. Boats routes include the best and the most attractive diving destinations of Indonesia Raja Ampat and Komodo National Park. So you can do many of unforgettable pictures. Diving itineraries of Hatiku Liveaboard include two of the most recognized Indonesian destinations between divers Raja Ampat and Komodo National Park. Raja Ampat is recognized for its great diversity of corals and fish. There is no other destination in Indonesia that can offer you such a variety. If you’ve already been to many places and dives everywhere, Raja Ampat is must see for you. Pelagic fishes, for example, giant trevally, barracudas, blacktip and whitetip reef sharks can be seen here. Of course, it’s not the end of the list. The second route, that can be offered byHatiku Liveaboard is Komodo National Park. Divers here have a chance to swim with numerous of reef fish. Of course, it is known for big Komodo dragons. Diving around Komodo and Raja Ampat is possible all year round. The time between April and November considered as the best for diving in Komodo. During this months, dry season lasts, that provides best conditions water temperature and visibility. From December to February mantas can be met more often. To dive in Raja Ampat is better to choose a time between October and April, from July to mid-September strong wind and rain can cause rough conditions for diving in this area.